In the normal course, JSW Steel, the country's second largest steelmaker, would not have given much thought to a sum of Rs 10 crore. The group spends 1.5 per cent of profit every year on activities related to corporate social responsibility, a long name for charity. JSW Steel, along with sister company JSW Energy, turned in a combined Rs 2,852 crore as profit last financial year. That leaves nearly Rs 43 crore to give away. Therefore, JSW insiders say they would not have sweated much while writing a cheque of Rs 10 crore to Prerana Education Trust. The trouble is that Santosh Hegde, the former Lokayukta, or anti-graft watchdog, of Karnataka, reads a lot more into this. Hegde, who authored a report on illegal mining as the Lokayukta, says it may not be a coincidence that Prerana is run by the family of B. S. Yeddyurappa, who resigned as Chief Minister on July 31 amid corruption charges. In addition to this, South West Mining, an associate company of JSW Steel, bought an acre of land in Bangalore for Rs 20 crore from Yeddyurappa's immediate family. Seshagiri Rao, Joint Managing Director and Group Chief Financial Officer with JSW, says this was the market rate; Hegde says it was 20 times more than the state government's guidance value. These, according to Hegde, are the key to JSW producing more steel than it could have with its legitimate iron ore quota (see interview "Who Would Raise Loans to Do Charity?"). Bad news was coming in torrents for JSW Vice Chairman and Managing Director Sajjan Jindal, who in recent times has emerged as a frontline business leader, especially after he acquired Ispat Industries last December. The Lokayukta report, which also names Adani Enterprises and NMDC, adds insult to the injury caused by the Supreme Court order of July 29 banning mining in the Bellary-Hospet-Sandur region of Karnataka, a belt that yields a third of all iron ore produced in India and feeds 25 million tonnes of steel production across the country. JSW, which has built a capacity of 10 million tonnes a year at its Bellary plant, needs 57,000 tonnes of iron ore every day to run it at full tilt. Little wonder, then, that the JSW Steel stock plunged 10.3 per cent on August 1, the first day of trading after the ban order. The company was forced to cut production in Bellary by 30 to 35 per cent after the ban. The production is slated to rise to 80 per cent after the Supreme Court allowed NMDC to resume mining in Bellary. But, as of August 10, the stock was still down 15.2 per cent from its close of July 29. That makes industry watchers wonder if it is really all about the ore.
JSW, meanwhile, is playing the victim . "Our application for a captive mining lease has been pending with the state government for 15 years," says Rao, pointing out that the company has invested Rs 33,500 crore in Karnataka even as the mining lease has been held up. But NMDC, owned by the government, has waited longer. "Our application has been pending for 21 years," says Chairman and Managing Director Rana Som. 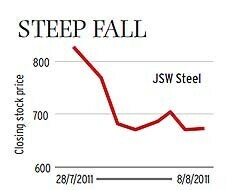 Perhaps it is more imperative for JSW to deal with Hegde's 28/7/2011 8/8/2011 charges.